This is the latest version of our Micro SD breakout board. 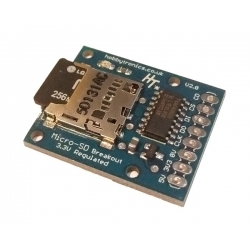 This one is slightly smaller and uses a different Micro-SD card socket which has allowed us to bring the costs down a little. 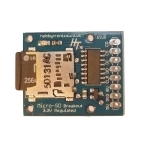 Using a MicroSD card is the easiest way to access data files from a microcontroller. But these cards all run at 3.3V, so if you are using a 5V system (like Arduino) then you need some form of logic level conversion between the two. 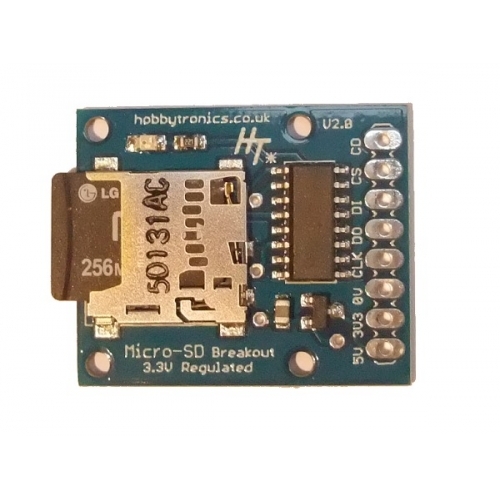 This breakout board does it all for you, it has a logic level conversion chip so you can use both 5V and 3.3V systems and also includes a 3.3V voltage regulator with spare output capacity for powering other devices. We also added a read/write activity LED. Use 3 or 4 digital pins to read and write 2Gb+ of storage! Card Detect output (CD) connects to 0V when card inserted. // On the Ethernet Shield, CS is pin 4. It's set as an output by default. // or the SD library functions will not work.